In an era in which the teaching enterprise is freighted with tactics, techniques, and methods, M. Robert Gardner guides us back to the spirit of teaching. He writes especially about the dilemmas and challenges of teaching, about how it feels to be trying to teach. 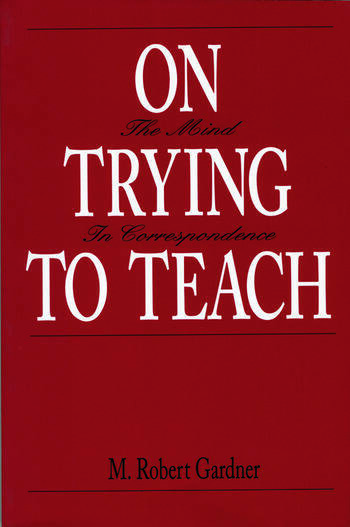 Gardner's provocative, often iconoclastic musings will goad teachers of all subjects to reflect anew on their calling. Clinical readers will take special pleasure in the humane psychoanalytic sensibility that not only infuses Gardner's own teaching, but shapes his approach to the most basic questions about teaching and learning in general. Preface: On Essay Teaching. Introduction: Beginnings. Part I: The School of Soft Knocks. The Furor to Teach. The Unknown Student. Gulliver at Home and Abroad. On Teacherly Versatility. The Warp and the Woof. On Creativity, Discipline, and Other Desiderata. A Concise History of Teaching. Concise Addendum to a Concise History of Teaching. Part II: A Gentle Symbiosis: The Student and the Teacher. On New and Old Beginnings. Gumbel's Gambit. Hidden Questions. On Catching Burrs. A Brief Case of Hidden-Question Chasing. More on the Besetting Challenges of Hidden-Question Catching. Some Added Questions on the Question of What Attention to Hidden Questions Is Good For. On Passing Events. Other Clues to Hidden Questions. On Purple Trees, Purple Cows, Telling Right from Wrong, and Bearing the Distresses of Being Wrong. More Reflections on the Nature of Hidden Questions. Once More Backward. On the Importance of Being a Bit Off. On Trying to Teach in Large Groups as Well as Small, or Almost as Well. On Finding Three-Ring Circuses and on Other Merits of Tending to Hidden Questions. Afterword: Studenthood. Other Thoughts on Assessing Teaching. The author of Self Inquiry (Analytic Press, 1989) and HIdden Questions, Clinical Musings (Analytic Press, 1995), M. Robert Gardner, M.D., is a founder and training analyst of the Psychoanalytic Institute of New England.